The week began with the arrival of my mother, Jean, from Florida and then about five days of 90's. Not unusual for Portland, but not a good sign for me having to sleep in the attic in a house with basically no air conditioning. I ended up on the living room couch for a few days because the attic was unbearably hot and didn't get out much in the yard other than to move the sprinklers around and to spot water the flowers. I had planned to have an Open Garden on Sunday and invited some very special Portland plant aficionados.That in itself gave me the collywobbles.But I was on vacation all week so I had a lot of time to get things done! I had so many things to obsess about over the week: the lawn needed mowed and edged, the laurels needed trimmed, the veggie garden needed weeded, the driveway needed washed, flowers deadheaded, street swept, etc... I didn't want beige grass for the visit, so I was watering like a madman to keep up with the heat. So many things to do! The heat kept me indoors with my mom, or sometimes to escape the heat inside we hung out under the walnut tree, chatting, sipping gin & tonics and feeding the fish. My Assistant Yvee lounging nearby, enjoying a nap in the grass. The contented happiness on her face apparent. Grandma Jean had worked hard training my Assistant all week (Drop it!, Sit! Leave it!) to no avail. 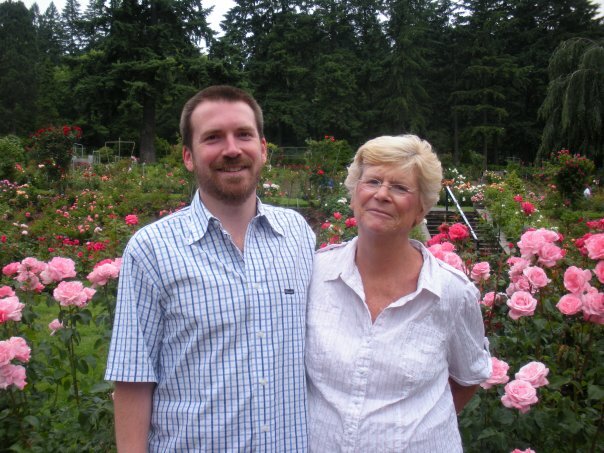 During the week, I took my mom to all our favorite Portland nurseries and we visited the Leach Botanical Garden for the first time. We didn't see much as mom had a broken foot in a boot, but we still managed to go and see a little. We will go again when her foot heals. It gives us something to look forward to on a future visit. The day of the Open Garden arrived and everything was set. I didn't get many of the things done that I might have wanted to, but in the end, what mattered was that I got to enjoy my imperfect garden, my perfect mother and some wonderful plant people. Sounds like all had a good time in your garden! Hooray! Your garden looked fabulous, I'm still so jealous of your Dierama AND Rudbeckia maxima. Thanks for the lovely afternoon in your gorgeous garden! I'm still in awe of your lobelia tupa. Yvette is such a darling. "imperfect garden"...clearly you see a much different garden than we all saw! Ditto what Loree said! And that Lobelia tupa is amazing!